Mitsubishi Chemical Advanced Materials has succeeded in developing a new 50-part vacuum hose and handle, 20 parts of which are moulded in glass-reinforced and unfilled nylon by Mitsubishi Chemical Advanced Materials CMS. Mitsubishi Chemical Advanced Materials CMS was also instrumental in introducing two-component moulding to the production process, further reducing production costs, whereby two sealing rings, used to connect the hose to the vacuum cleaner, were combined to a single ring that can be moulded directly onto the hose module. 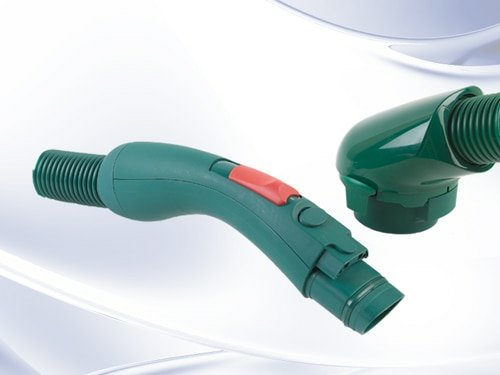 Additional functional benefits of the module’s new design include the integration of functions into the handle, such as a 4-stage switch for suction regulation, and improved performance in terms of pressure drop, thus maintaining maximum suction. With regards to aesthetics, the new ergonomic handle pleases with its slim design for ease of handling. Mitsubishi Chemical Advanced Materials CMS was initially contacted with a design concept for the micro filter system to be fitted on a range of drilling machines. Having experience with designing and producing powertools for several decades, Mitsubishi Chemical Advanced Materials CMS refined the concept to create a functional system. We also implemented the necessary changes in the design to create the shut off surfaces and draft angles, in order to make it feasible for molding, whilst at the same time making changes to improve the assembly process. The system exists out of 19 plastic components, which are produced in 15 different injection molds. The materials for the different components range from PP, PA, and ABS till PC. The injection molding and the assembly process of the complete module will be done in-house by Mitsubishi Chemical Advanced Materials's plant in Hungary. During the assembly of the molded parts, several inserts such as: springs, filter and screws are required; which needed to be defined and sourced by Mitsubishi Chemical Advanced Materials. Finally 2 additional parts need to be ultrasonic welded and printed. 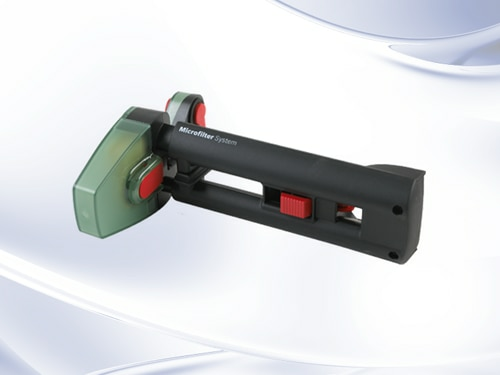 The complete assembly is performed manually with the use of easy assembly jigs. How this system works? The assembly needs to be mounted below the motor of the drill. The motor fan of the drill builds up a vacuum in the system. This vacuum passes through the filter to where the drilling action takes place. The dust is pulled into the assembly and remains in the dust box. This sounds easy, but when the components do not fit properly together there is a loss of vacuum, and the efficiency drops. Also the filter action is very important because dust shortens the life time of a drilling machine very quickly. Tests show that the use of a drilling machine equipped with a micro filter system increases the lifetime with a factor 10.